Consilient offers several popular protocol stacks necessary for building complete communication middleware. These protocol stacks come with well defined APIs necessary for easy integration into customer's product context. The diagram below depicts the various protocol stacks available from Consilient. Call control module consists of implementation of various call/session initiation and control standards. It includes SDP negotiation capability along with implementation of SIP (RFC 3261) / H.323 stacks provided under a simplified set of APIs for easy integration into overall application framework. 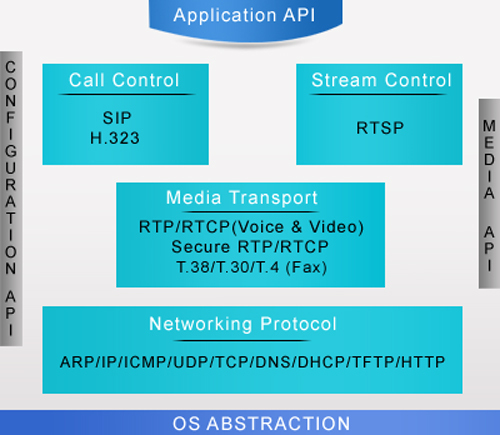 Consilient offers RTSP (RFC 2326) as stream control protocol. This implementation comes in two variations. One is the client implementation of RTSP protocol and other being the back to back implementation as RTSP relay agent. Consilient offers various protocol implementations required for transmission and reception of media streams. Networking stack has been designed for embedded platform that does not have OS. It provides essential functionality necessary for a complete IPv4 networking capability for an embedded product.